I was so careful this year. I really was. I thought a lot about each person in the Christmas story. I read about the census, the journey, the angelic visits, the dreams, the shepherds, the inn, the manger, the betrothed, the instructions, the swaddling clothes, the wise men, the star, the kingly gifts, Mary, Elizabeth, Zechariah, Herod, and of course Jesus. Heck, I even listened to Linus’ Christmas soliloquy on that famous animated stage. More than once. Covered my bases, soaked in it, and thought for sure I’d given the advent season its due. I’m one of those people that takes the Christmas decorations down pretty much as soon as Christmas day is over. And sure enough this year I was true to form. With family still gathered around, I dismantled the mantle, I unlit our pre-lit tree, and I put every ornament back into its nice, neat, storage box; the one I’ll touch again just after Thanksgiving 2015. Call me scroogey. It’s okay. I’ll own it. One of the last things I put away was our nativity scene. I really don’t know where this came from and I always faithfully overlook the fact that in these mass produced trinkets, the magi are always placed at the manger (something they historically never saw), but I’ve got to admit it: I like our nativity set. 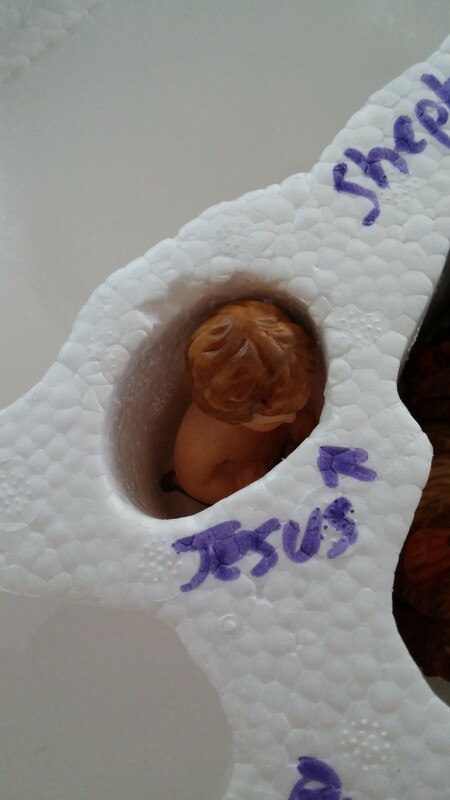 Its got a nice Styrofoam tray that each piece of the nativity fits in. A few years ago I got the idea of labeling each compartment so as to speed up the clean up even more each year. But when I picked up that thumb-sized baby and dropped him into that snug cocoon he’ll be in for the next year, I had an epiphany. I’M in this story. The Christmas story I mean. In fact, I’m more a part of this story than the (alleged) camels, than the shepherds, than the wise men, than Joseph, and even than Mary. I’m in this story and so are you. WE are the unseen attendees of the nativity. We are the attention of the Advent. We are reason the baby came. You are. I am. We are. Don’t think so? Read the gospels. Or just read John 3:16. Its right there in black and white. Did you miss that detail this Christmas? Were you too busy singing “Mary Did You Know?” that you didn’t realize YOUR place in this story? Did you celebrate the major players in the story and completely omit the fact that we are not outsiders looking in but insiders looking out? That we–by virtue of the love of the Father shown through the Son–are the sole object of His affection? And furthermore that the Christmas story is far from over? That really the Christmas story concludes (if ever) only when Jesus is finally seated as Lord over all and every creature confesses Him as Lord? Isn’t the story complete when the King who came to reach us all is the King who reigns over us all? So while the décor of our homes may change as we wrap up this season, may the understanding of our hearts maintain that you and I are in this story as well. And that the King who came once is the King who will come again and will graciously conclude this Christmas story. ← Are You There God? It’s Me, Jerry.